State fair food is everything that normal, healthy eaters eschew: the deep-fried, the absurd, the bacon-wrapped. But for a few weeks a year, these uber-unhealthy foods are not only tolerated, they are celebrated. In the last week, state fairs in Minnesota and Iowa – two heavyweights in absurdist fair food – revealed their food lineups for 2015. The offerings are far more creative than they are healthy, but when it comes to imagination, they can't be beat. 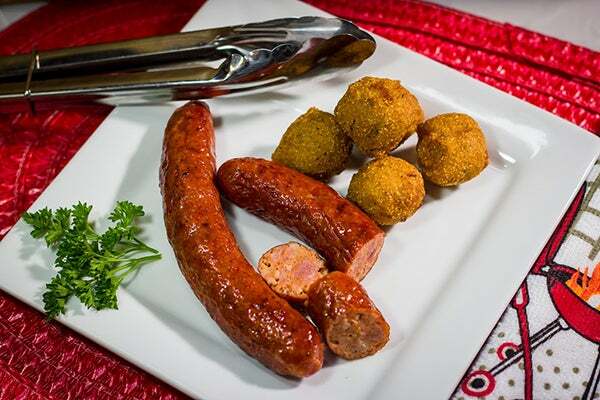 While some states – like Texas, which doesn't hold its state fair until late September – haven't yet revealed their new food, there's no time like the present to prepare for these unbelievable culinary creations. Here are 12 of the most absurd new foods that are being served at state fairs across America in 2015. Bacon fans should plan a pilgrimage to Iowa this year. 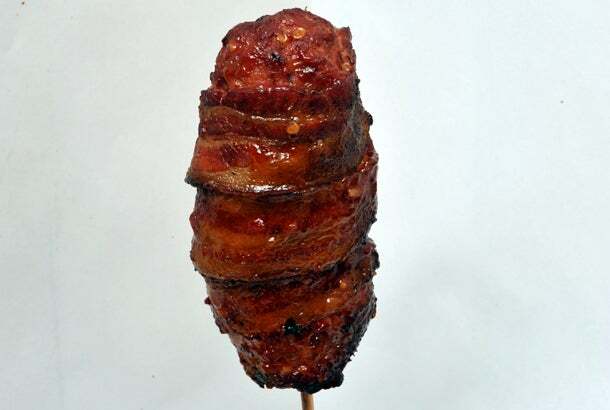 This pork-heavy treat is made of 8 ounces of fresh brisket trimmings blended with jalapeno cheese and seasonings, then wrapped in bacon, coated with barbecue sauce and stuck on a stick. It is also 100-percent gluten-free, if you're down to have a heart attack but want to maintain your gluten-free lifestyle. Indiana is currently in the process of deciding which fair food will be the state's 2015 Indiana State Fair Signature Food. Our vote: the S'mores Shake, a s'mores flavored drink with a s'more stuck on top. 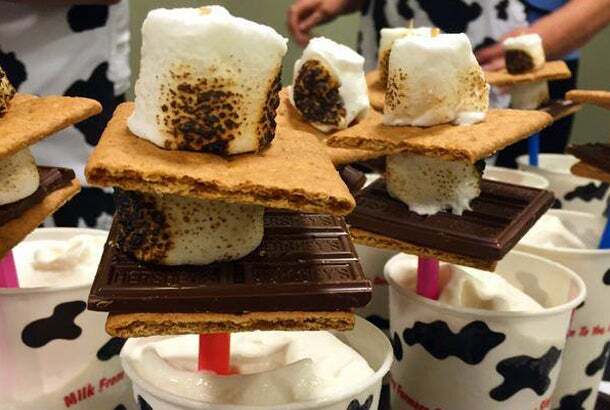 However, even if it is beat out by offerings like deep-fried sweet corn or deep-fried apple bites, the S'mores Shake will still be served at the fair. In a fair-friendly twist on an American classic, the Iowa State Fair is serving up apple slices dipped in funnel cake batter and apple pie spice, then deep fried. The Apple Pie On-A-Stick is then topped with cinnamon sugar and served with a side of caramel and apple wedges. 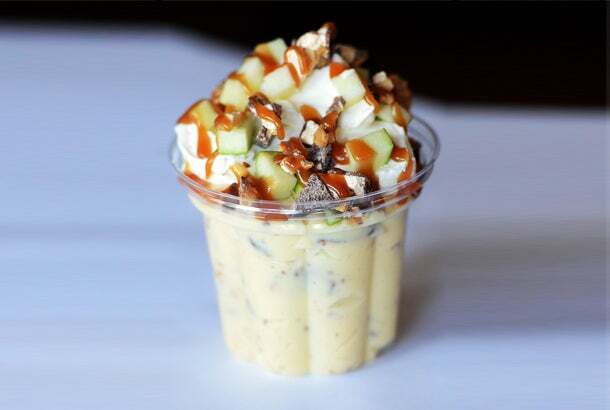 To create this uniquely Minnesotan salad, The Blue Barn is serving up chopped Snickers bars and Granny Smith apples mixed with vanilla pudding, whipped cream and caramel sauce. While Snicker Bar Salad is a foreign concept for much of the world, it is in fact something your Minnesotan aunt might serve up – it's a potluck classic in parts of the Midwest. How much pork can you handle with your pizza? 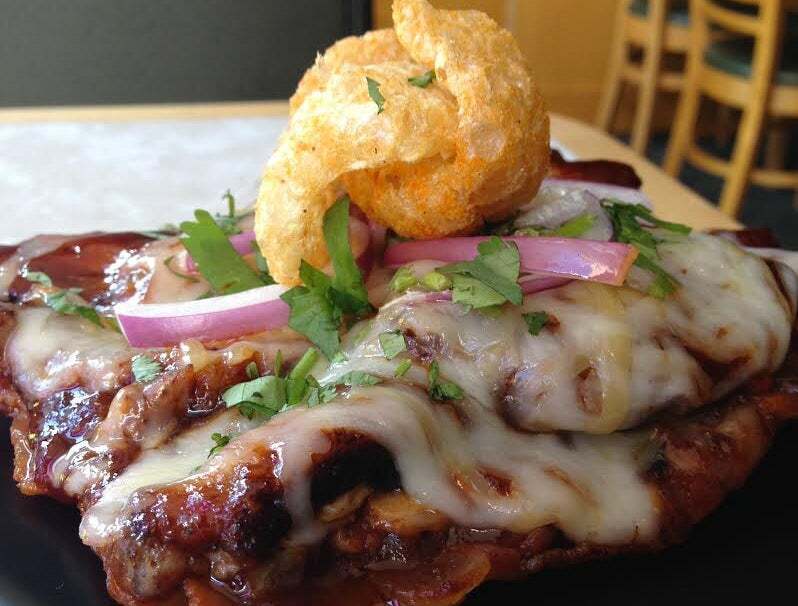 The Wisconsin State Fair is serving a pizza that swaps out its crust for a bacon weave bottom, which is covered in BBQ pork shoulder, mozzarella and Gouda cheese, red onion, cilantro and crispy pork rinds. Florida actually already held its 2015 state fair, back in February. 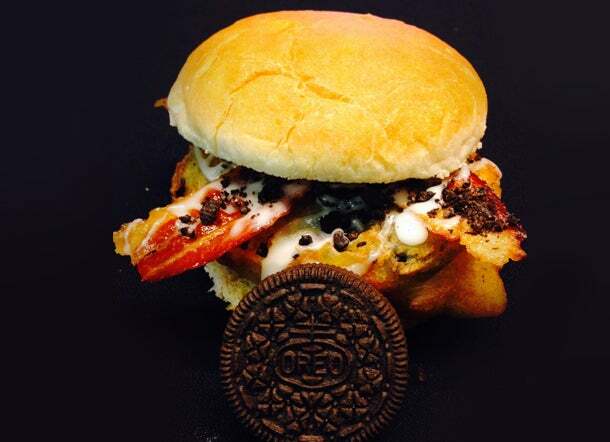 One noteworthy newcomer: the Deep Fried Oreo Burger, a beef patty covered in Oreo cookie batter, then deep-fried. The burger comes topped with bacon, glaze and crumbled Oreos, plus another Oreo for dessert. In a visitors' vote, the Oreo Burger ended up being in the middle of the pack in fairgoers preferences, with the twice-fried Parmesan Crusted Burger in first and the spicy Jalapeno Crusted Burger in second. It did, however, beat out the brie-topped Burger of the Gods and the Thanksgiving-theme Holiday Express burger. Because nachos aren't unhealthy enough, Iowa is deep frying ground beef, jalapenos and cheddar cheese that has been rolled in a crust of Nacho Cheese Doritos. 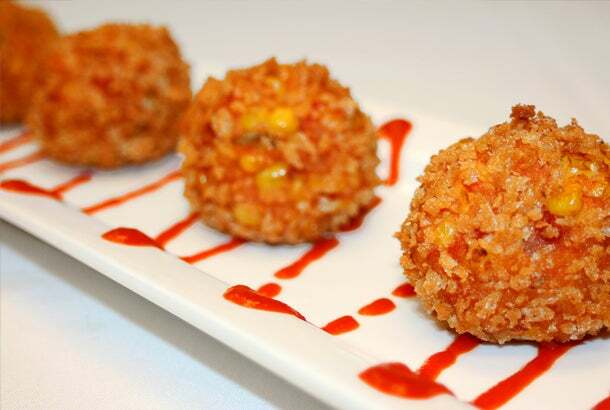 The resulting deep fried balls are then served with nacho cheese. 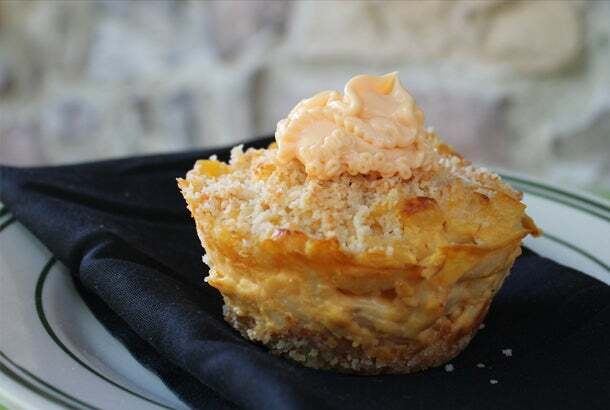 The Minnesota State Fair's Mac & Cheese Cupcake is actually closer to a mini mac and cheese pie – macaroni and cheese in a breadcrumb crust and frosted with Cheez Whiz. 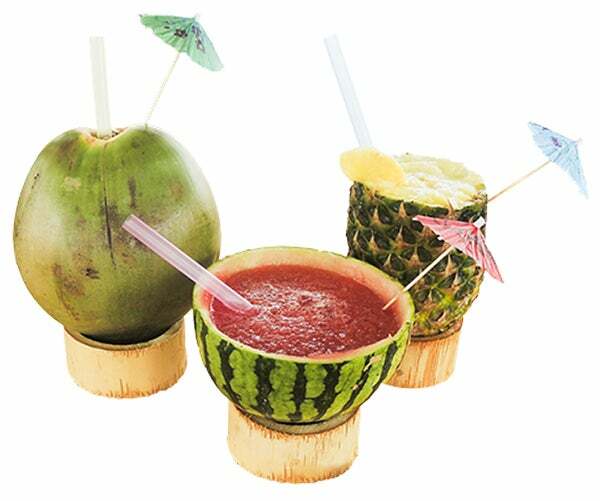 "Drink a fruit from a fruit," states the Wisconsin State Fair website. Sounds like the perfect, enormous drink to keep you hydrated while at the fair. California hasn't announced its new state fair foods yet, but there's a good chance deep-fried Starbucks will be on the menu. The deep-fried balls of ground coffee on a stick, served in a Starbucks cup, have been popping up at fairs up and down the California coast, including the San Diego Fair. You can get these fried balls of spicy joy at the Minnesota State Fair two ways: a blend of chicken, corn, tomatoes, egg and Sriracha or the same ingredients mixed with Sriracha cream cheese. Both mixtures are deep-fried and drizzled with Sriracha sauce. Wisconsin is checking all the fair food boxes with this one. Deep fried? Yes. On a stick? Yes. Exotic meat? Yes, again. Dig in. Kristen Bell and Her Cofounders Built a Company to Save Lives. But Growing It Wasn't So Simple.